This website does not link to other commercial lodging "review" websites (such as Tripadvisor) as we have found they often do not give our prospecive guests an unbiased opinion. Please feel free to review guest input on the various links you'll find here. Experience Nashville Indiana, historic hoosier artists colony. Enjoy Brown County Coffee at local coffee shops and eateries. 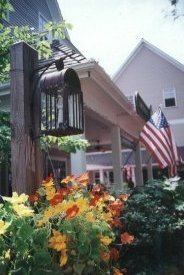 Browse quaint Nashville Indiana Antique Shops and tour the historic Art Guild and Brown County Art Gallery. Don't miss the many Nashville Indiana shops and craft galleries. See glass blowers, potters, weavers and leather crafters at work in the village. You might want to look at some Brown County Homes for Sale or Brown County Real Estate for your retirement. Brown County Indiana is a popular retirement location with a wonderful golf course, library and YMCA, plenty of art and entertainment and wonderful recreation opportunities. Visit Brown County Indiana soon..."Restoreth Your Soul"